If you’ve questioned whether real time search is relevant or not – or if you’ve questioned the importance of Twitter in our world of data access – then this should close the argument for you! 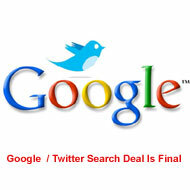 Google just announced a search deal with Twitter to provide real time search data in their (Google’s) search results. The world is hungry for up to the minute data, and nowhere is more fertile with that data than Twitter! Google has already been making moves of it’s own toward real time search data. Recently, they’ve updated their search results with options where you can chose to see results from the last week, day, and even from the last 24 hours. The only void left to fill then beyond the “last 24 hours” would be within the last second!